If you are anything like me when you first hear about rural Thailand you brain conjures images of grass thatched huts, traditional Thai clothing and half naked women working the fields. Alright, the half naked woman thing is just a defect in my brain but the rest is usually what a westerner sees in their mind if they have never been to rural Thailand. Of course those images couldn’t be further from the truth. While the actual villages on the outskirts of town may conform slightly to those images the towns themselves are very modern and the people go about their daily business much like we do in the west. Nothing brings this home more than what I ran into while out and about in Nakhon Phanom one evening taking pictures. 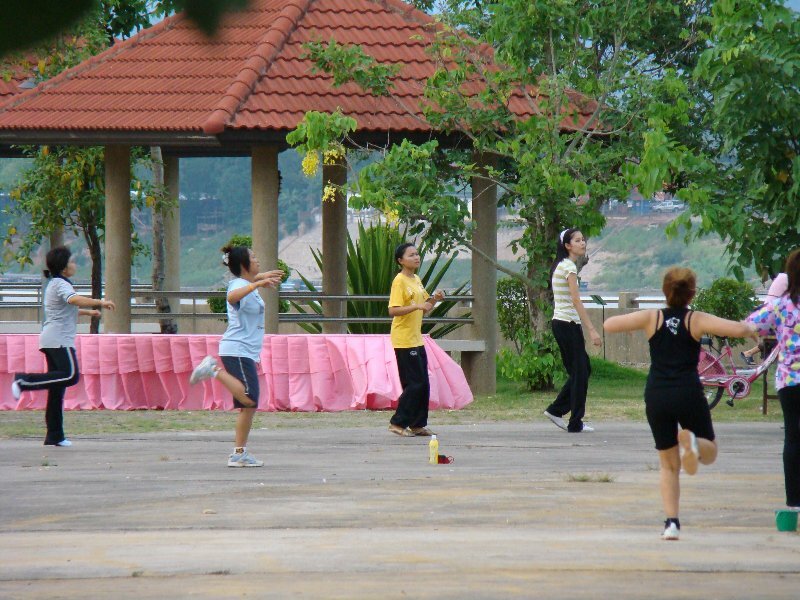 There is a small park right on the Mekong between the Grand View Hotel and the View Kong Hotel in Nakhon Phanom where every evening at 4pm a regular excercise class is held. As much as most of us would like to believe that Thai women don’t have to do anything to maintain their lithe figures, they would disagree. The evening excercise class is free to anyone that would like to take part and it even includes an instructor with a sound system and music to work out with. A lot of ladies and some husbands turn out for the free classes and they seem to have a great time. 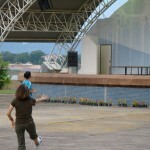 They even bring their children who have a nice playground to play in while Mommy or Daddy work out. If dancersize isn’t your thing the small park also has outdoor workout equipment such as weight benches, stationary bikes and ab crunch machines. If running is your thing the whole park has a nice track surrounding it that gets some serious use. Even the Thais realize that it takes more than a good diet to keep yourself fit and healthy. 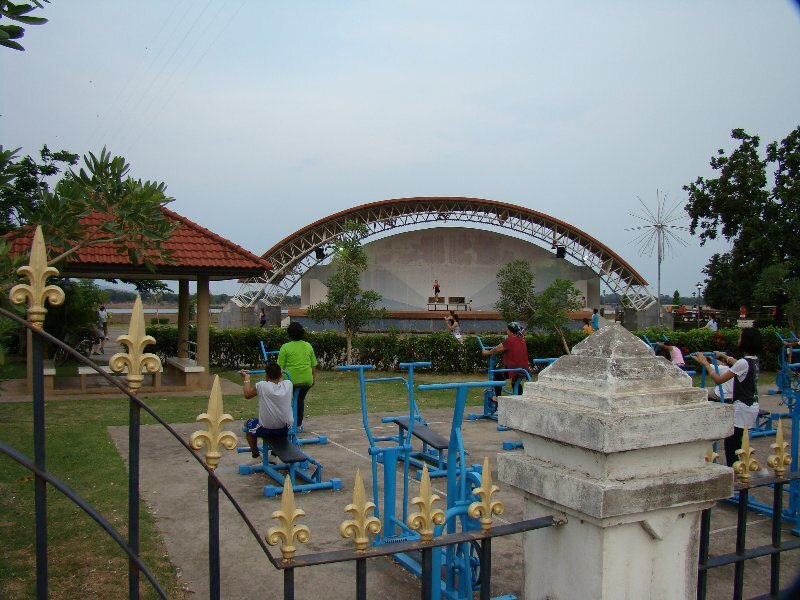 If you are ever in the vicinity of Nakhon Phanom and are looking for a good workout give the park a try, I’m sure you’ll be pleased. 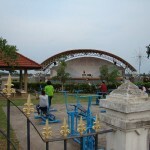 Talen I have witnessed a similar free exercise class in Prachuap. Initially I was quite surprised (same reasons as you) however as I have settled in here I have started to realise that all Thais are not the lithe young things of our fantasies. Although the diet is quite healthy Thai cooking often uses large amounts of oil some of which will definitely add the pound. 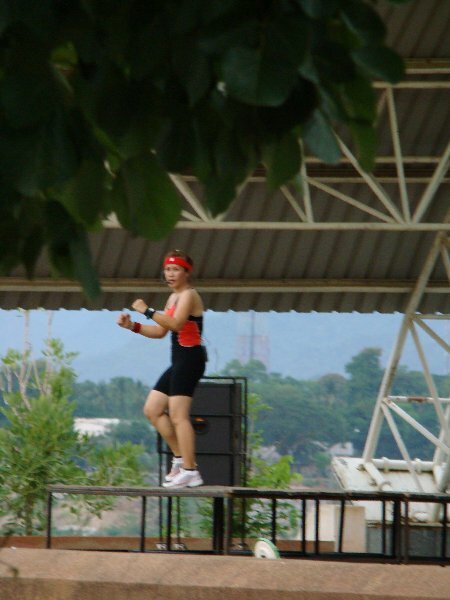 My biggest problem as an expat is keeping fit, since the heat and humidity tend to deter me from strenuous exercise. So true Mike…I forgot about the copious amounts of oil and butter used. My biggest problem keeping fit in Thailand is I become lazy as hell. I love to ride my mountain bike at home but I don’t know if I can do the same in Thailand. We also have the same in Bangkok. They take over large areas (sometimes on a stage), set up a sound system, then someone starts everyone off. If you get up early, in Queen Sirikit Park (by JJ Market) you’ll find various activities going on. Tai chi seems a favourite. Dotted around the park under the shade of trees, you’ll find elegant groups of Thais slowly moving. And they even have bowls set up in the park. I took my set but the field isn’t very smooth. No matter, it’s there if I want it. It seems America has a lot to learn from it’s Asian Allies. We’ve become the fattest country in the world where nothing is ever free except dessert at the fast food joints when you buy more than one grease riddled meal. I don’t know enough about Thailand to be sure, but I would think that the average diet is not very calorie intense or high in fat. Talen, I have the same problem in Thailand. It is just too hot. When I’m in temperate climates, no prob. I am energised with all sorts of get up and go. But not here.